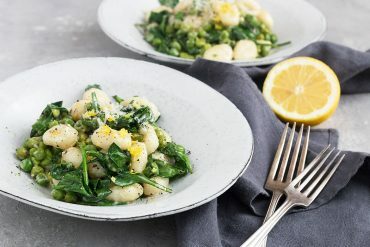 Full of flavour and weeknight easy! 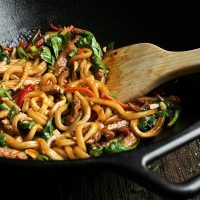 This 20 Minute Spicy Pork Udon Stir Fry uses wok-ready udon noodles means no boiling is required, so dinner is ready in just 20 minutes! 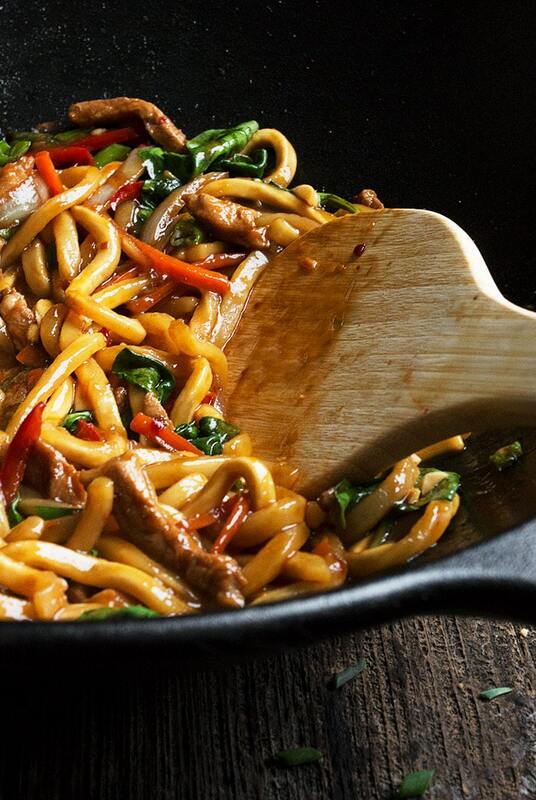 Udon noodle stir fries are a favourite fast and easy meal around here. I love the heartiness of these fat noodles! 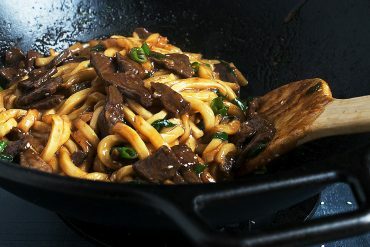 This 20 Minute Spicy Pork Udon Stir Fry, combines quick marinated pork with vegetables, udon noodles and a spicy sauce. Don’t worry though if you aren’t a spice lover. You can easily control the heat. If you start with fresh, frozen or shelf-stable, vacuum sealed udon, there is no need to cook the udon ahead. They can go straight into the wok! For frozen udon noodles, place them in a bowl of cold water to thaw just before you start your stir fry and then right into the wok. This udon stir fry is the 2nd of three recipes I’m sharing this week that use “Fast Fry” boneless pork loin cutlets. Check out my Pork Tonkatsu Bowl, for another recipe. Watch for a 3rd pork loin recipe on Saturday. The heat in this udon stir fry comes from the Sambal Oelek. Using the 2 tsp will give you a nice kick. Add more if you’re a spice lover and of course, less if you’re not :) Sambal Oelek is more powerful in the heat department than Asian Chili Garlic Sauce. If you are using that option, you may need a bit more. You could easily substitute boneless chicken (thighs or breast), for the pork in this stir fry. Or leave out the meat altogether for a vegetarian version. As noted in the recipe instructions, as we are using the same sauce as a marinade (with the raw pork) and as a sauce in the stir fry, you’ll want to be sure to boil the finished sauce for several minutes, to ensure any meat juices are cooked. Love udon noodles? 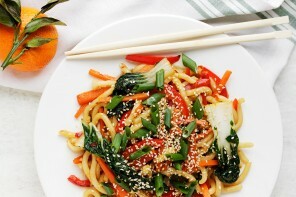 Check out my vegetarian 15 Minute Udon Stir Fry, this spicy orange udon stir fry or this Udon in a spicy peanut sauce. Udon noodles come in many forms. The most commonly available are the shelf-stable, vacuum packed soft udon. These usually come in packages of 2 or 4 individual packages of about 7oz. each. These can go straight from the package into the wok. When I’m at the Asian Market, I like to pick up frozen udon. Frozen udon would always be my first choice for udon noodles, if they are available. The frozen udon is generally one package, but inside you will probably find 5 segments of noodles, of about 7.5 oz. each. To use, simply break off what you need and thaw them in a big bowl of cold water (takes only about 10 minutes), then they go straight into the wok. While conventional wisdom suggests that these should be boiled ahead, I’ve never found that to be necessary with a stir fry. They cook up just fine for me without pre-boiling. If you are very lucky, you might find fresh udon noodles. They are scarce though. If you do find some, they can go straight into the wok, too. Finally, there is dried udon noodles. Like dried pastas, these must be boiled before using in a stir fry. I’ve never found dried udon to be worth the trouble of boiling them. They lack that fat appearance and chewy texture that I so love about udon. 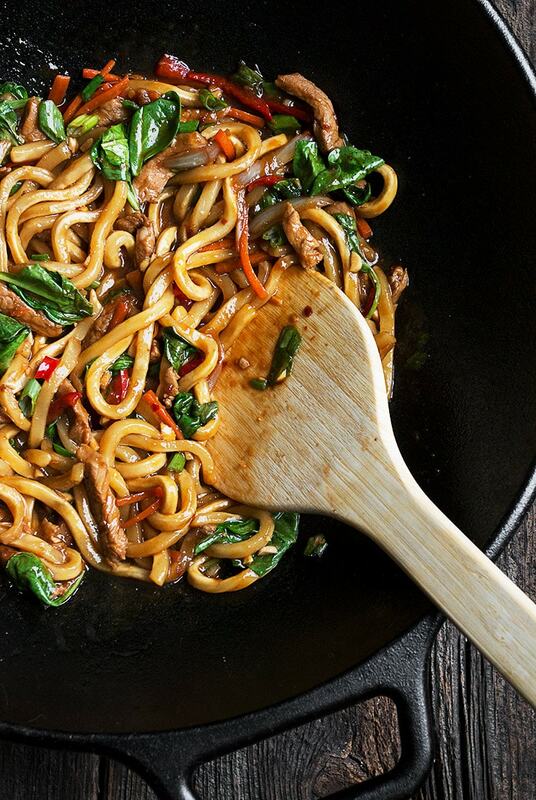 Easy and delicious, this spicy pork and udon noodle stir fry is ready in just about 20 minutes! In a medium bowl, stir together the Sauce ingredients. Set aside. Trim any bit of fat off the then pork loin cutlets, then slice against the grain (width-wise) into bite-sized strips. Place into sauce and set aside to marinade a bit while you prepare your vegetables. Prepare your vegetables by cutting your carrots and red pepper into matchsticks. Slice up the onion and green onion and have the baby spinach at hand. Keep separate vegetables separate, as they will be added at different times. 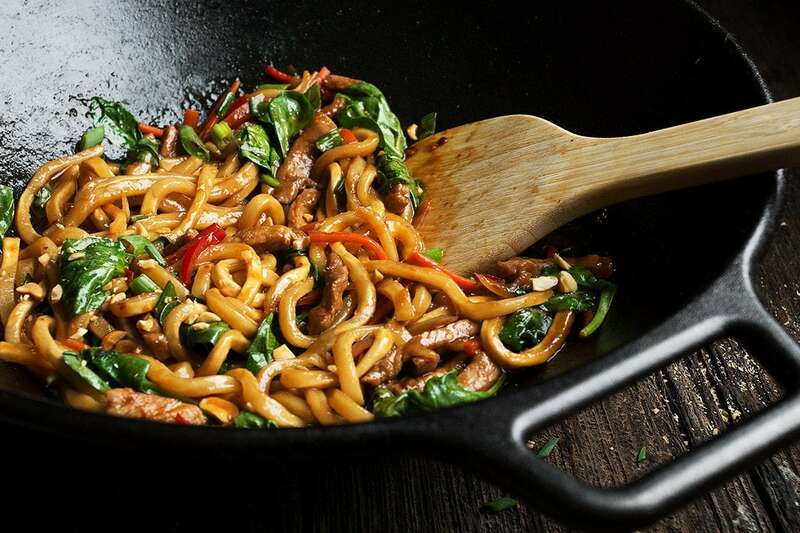 Heat a Tbsp of oil in a wok or skillet over medium-high heat (or a touch higher even) until hot. Using a slotted spoon (or strainer) remove the pork pieces from the marinade to the hot wok. (leaving the marinade in the bowl or reserving marinade). Cook pork, stirring, until cooked through. Remove to a bowl. Add carrots to wok and cook, stirring, for about 2 minutes (I sometimes like to add a tablespoon of water here, to help the carrots cook more quickly and thoroughly). Add red pepper and cooking onion and cook a further minute or so, or until tender crisp. Add the green onion and cook, stirring, for another 30 seconds or so. Return pork to the wok. Pour reserved marinade into wok and bring to a boil. Allow to boil for a minute or two. *Note: As we used the marinade earlier with raw meat, it is important that the sauce boil for several minutes, so don't skip that part. Add udon to skillet and cook, tossing until udon is hot and well coated with sauce, 2-3 minutes. Remove wok from heat and scatter baby spinach overtop. Allow to sit for 30-45 seconds, then toss the spinach into the stir fry, where it will wilt slightly from the heat of the stir fry. Serve warm, garnished with chopped peanuts and additional sliced green onion. I had a pork tenderloin that needed to be used up, and I wanted something different. 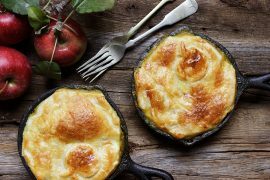 This was a fantastic recipe with just the right amount of heat and a lot of flavor. I added parboiled broccoli to the veggie mix. The family raved about this meal. Will make again soon! 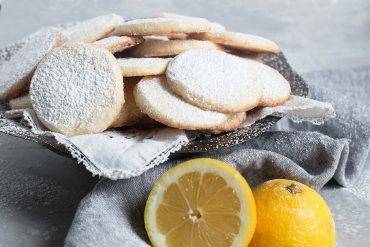 Wow thank you so much for this great recipe! I did substitute the carrots for mushrooms and used ground pork instead and it turned out great. Will definitely make again! Made this last night and it was EXCELLENT! Followed the recipe but made one addition of a couple of celery stalks sliced thinly. It adds a nice crunch. Just tried the Spicy Pork Udon Stir Fry, it was EXCELLENT!!! So many times I try to make a stir fry and the flavor is just so, so, but this one is spot on. 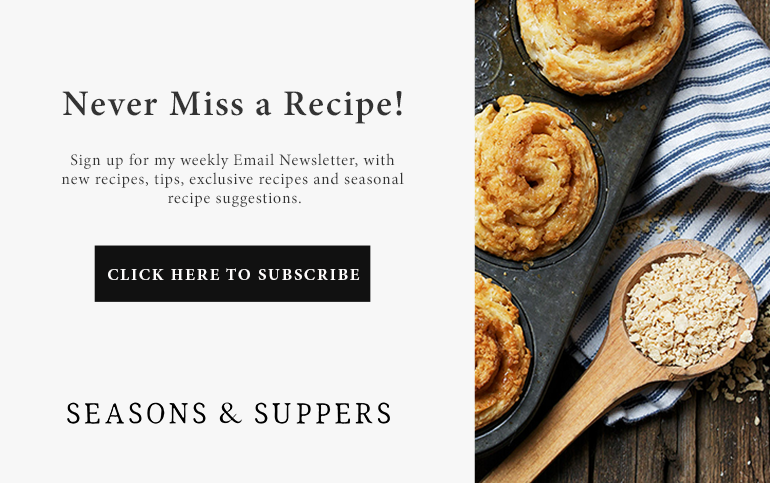 Hi, I just wanted to express our delight in finding your recipe. 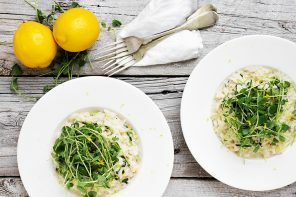 I’ve made this meal several times now and we just love the beautiful flavours and aroma of this dish.mmmm mmmm mmmm. Holy mother of food bloggers. Your recipes have always impressed me but you just brought your A-game this week! WOWZA! I’m all kinds of craving udon stir fry now! 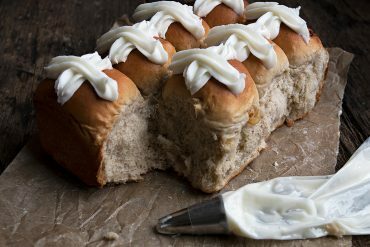 I don’t know what’s making me drool more, your food photography or written recipe. PINNING! I actually have a bag of udon noodles in my pantry and they are just BEGGING to be made into this delicious stir-fry, Jennifer!!! I love anything spicy, so this is right up my alley and perfect for dinner tonight! Cheers, friend! These are just scrumptious, Jennifer! I see your point about using the fresh udons. That’s probably the missing piece on why when I make udon noodles the texture seems off. Delicious sauce! Thanks Sue :) Pork is in regular rotation here, so always looking for new ways to enjoy it! I love Udon noodles and especially when tossed in a gorgeous rich sauce like this! The perfect meal any time of the day for me. Pinning to try later! Girl, you are just hitting it out of the park with all these delicious recipes! Another one I have to add to my ‘to try’ list. Big ‘ol YUM! Yay for more recipes for those pork cutlets! Tom and I would both really enjoy this one Jennifer. And only 20 minutes? Yes! 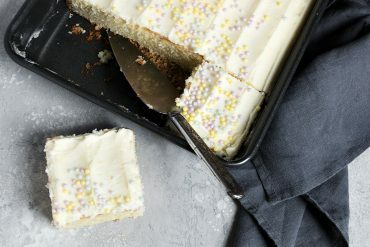 It’s hard to believe that this can be ready in just 20 minutes! So much flavor packed in this beautiful dish! Loving your pork recipes, Jennifer!! Thanks Annie and yes, udon stir fries are one of my favourite fast and flavourful meals!